Topper Industrial Rotation Carts are able to manually rotate and position parts for minimized over reaching and lifting. A tilt cart is a specified industrial cart base with a rotating top. The tops rotate 360 degrees to the various operator workstation. The heavy duty industrial Rotation Carts come in a four-wheel or six-wheel design. The operator is able to rotate the unit by releasing the foot actuated detent to rotate and access parts from any side from one position. The detents automatically lock every 90° or 180°. This secures the rotation top, so that the operator can work out of the unit safely. The effortless rotation is due to the heavy duty sealed precision slew bearing that can handle cantilevered loads with ease and is virtually maintenance free. Rotating the unit is easy by releasing the foot actuated detent to rotate and access parts from any side from one position. The effortless rotation is due to the heavy duty sealed precision roller bearing that can handle cantilevered loads with ease and is virtually maintenance free. Rotating carts with spinning decks allow the cart to turn and bring the material closer to the operator. The rotating and tilt carts can be equipped with towing equipment. It is possible to connect these carts as pull behind carts in tugger train systems. That makes it more efficient to transport these carts in a train rather than one by one. The rotating carts can be adapted to different container sizes and to different weight requirements. Topper Industrial Tilt Carts create a safe, controlled and ergonomic delivery work station lineside. 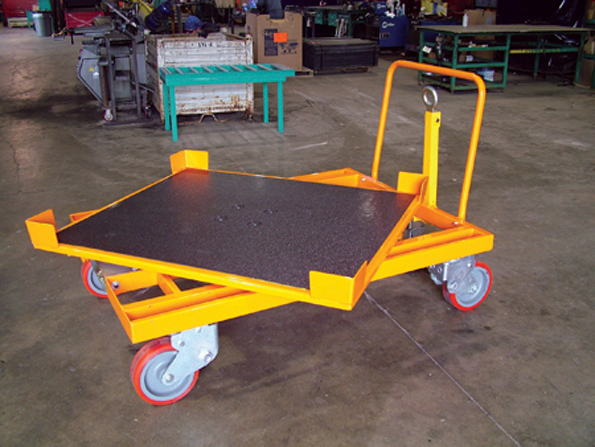 A Tilt Cart is a rugged industrial cart consisting of a unique upper frame that is designed to fit a specific container and tilt to a desired angle. Topper Industrial’s tilt carts come equipped with a patented adjustable closed loop hydraulic cylinder that controls the energy of the load as it is tilted. It provides for a safe and controlled tilt movement in a full to empty application. The most common requested degree of tilt is 30, 45, and 60 degrees, but the carts can be custom designed to virtually any angle. Tilt Carts are designed as four-wheel or six-wheel carts. The swinging motion of the tilt cart makes it easy for your operators to be able to pick the necessary parts from boxes, containers and pallets, while also ensuring high ergonomic standards. Whether rotation carts or tilt carts, most can be extended and widened for bulky loads or configured for the movement of smaller, more fragile products, as padding and other forms of protection can be added when necessary. By using custom-built carts, manufacturers improve transportation efficiency, as they reduce the number of trips necessary to move parts to assembly lines and products to warehouses and distribution centers. Topper Industrial is exhibiting at ProMat in Chicago at Booth #S4812 from April 8 – 11. Topper Industrial education session is titled, “Why is Cart Delivery in High Demand?” in Theater I at 1:30 pm on Tuesday, April 9, 2019 and repeated on Wednesday, April 10, 2019 at 10:30 am in Theater E. Visit our booth at ProMat.